This is a unique reading list – these books were all written by librarians and most of them were recommended to us by librarians. If any profession is well qualified to write books then librarians truly fit the bill. Librarians are loyal customers of AbeBooks and we tend to listen when they speak. But it was interesting to see so many librarians recommend Casanova’s autobiography – were they trying to tell us something? This famous Italian adventurer and lover was a librarian in the household of the German nobleman Count Waldstein. The authors on this list range from the top dogs at the Library of Congress to folks who have worked at the national libraries of Argentina, France and Sweden, and people who have checked books in and out at public and school libraries. We decided to exclude Chairman Mao and his Little Red Book. This one-time librarian at Peking University is perhaps the most widely read of all librarians who wrote but it was under extraordinary circumstances (although it is now thought the book was ghostwritten). Our featured book (pictured at left) is Hemlock and After by Angus Wilson, illustrated by Ronald Searle, and was a bestseller in 1952. Wilson was a librarian in the British Museum. A post-apocalyptic tale from 1952 – Norton was a librarian in Cleveland and the Library of Congress. Clark Powell was a librarian at UCLA and the William Andrews Clark Memorial Library. Larkin was a librarian at the University of Hull. Jill is a novel about life in Oxford during WWII. L’Engle was a volunteer librarian in New York. 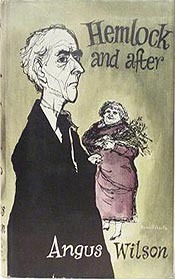 A scarce novel about a troubled marriage. This modernist poet, noted for her wit, worked in the New York Public Library in the 1920s. Patron won a Newbery Award for this children’s book. She worked at the Los Angeles Public Library. A novel about conflict in small town 1930s America – Berger was a librarian and journalist. MacLeish, Librarian of Congress from 1939-1944, was also a playwright, journalist, lawyer & statesman. Written by a former public librarian, this novel (about a librarian) was a National Book Award nominee. Cleary worked as a children’s librarian in Yakima, Washington, before writing children’s books. An agriculture librarian at the University of Illinois, Brown’s 1971 book remains a non-fiction classic. Brown was a former librarian from the State Library of South Australia. Borges was a director of Argentina’s National Public Library. This is a collection of 11 short stories. Strindberg worked for eight years as an assistant librarian at Sweden’s National Library. This novel was a finalist for the Pulitzer Prize. Tyler is a former librarian and bibliographer. An ex-librarian & a bookseller, Petterson’s novel was one of the NY Times’ books of the year in 2007. Histoire de L’Oeil is a controversial novel from 1928. Bataille was an archivist at France’s National Library. Juarroz was head of Bibliotechnology & Informational Science at the University of Buenos Aires. This Canadian is a Master of Library Science. This book won the Stephen Leacock Medal for Humor. Breem was a legal manuscripts librarian in London – this novel is a Roman kidnap adventure. A novel set in medieval England in 1255. Schiltz is a school librarian in Maryland. A true bookperson, Shaffer worked as a librarian but also in bookselling and publishing. This great lover was a librarian in Count Waldstein’s household where he wrote his autobiography. Davina worked for London’s Westminster Libraries and still volunteers at St James’s Library.